How is my Home Page organized? - Screener Activity is where you can manage your screener(s), viewing requests and invitations and download viewing reports. Click on the wheel icon at the top left of the toolbar and you will be able to change your password, the language, or your e-mail notifications settings. A valid e-mail address is mandatory if you wish to receive notifications (you can also choose the frequency of your notifications). Moreover, you can hide your e-mail address from Cinando members. However, you will still receive the notifications that you have chosen. Click the SETTINGS tab > "Change my password" > type your new password > "Validate"
You can choose either English or Spanish by clicking on the corresponding flag at the far right of the toolbar. Or you can do so by visiting the SETTINGS tab. Where can I find the MY ACCOUNT tab? Your account can be accessed by clicking MY ACCOUNT in the toolbar at the top of any page. Who is eligible for a Cinando subscription? Only professionals working within the cinema industry are granted access to Cinando: mainly feature film producers, distributors, sales agents and film festivals, as well as TV broadcasters and distributors, VOD platforms, law firms or service companies that specialize in the cinema and entertainment industry. Please remember that only companies can register for Cinando. Freelancers cannot submit a subscription request. Moreover, every subscription request must be approved by the Cinando team. What is the price of a yearly subscription and how can I pay? A yearly subscription costs 85 euros. You can pay online by credit card (all major credit cards accepted). To subscribe as a new customer, simply click Register on the home page and follow the instructions. To renew your subscription, log in to your existing account and the following message will appear: "Sorry, your company subscription has expired. Click here to renew." Click on "Renew"' and follow the instructions. *Please note that you can receive complimentary Cinando access by registering with our international markets partners. How do I obtain an invoice for my subscription payment? Once you are logged in to your Cinando account, click the MY ACCOUNT tab > scroll down to your Account History and click on the transaction 'Purchase of Initial subscription...' Then, you will be able to download and/or print your invoice. Once my company is registered, how many staff members can join? Each subscription is attached to a company, so you can add as many staff members as you need. What is a personal login and password? Each member of a company has his or her distinct login email and password. Once a new staff profile is created, he or she will receive an email with their login details. On the top right of the home page, click on "Forgot my password" or "Member Access" and "Lost my password." Your password information will be sent via email. When I register for Cinando, can I access all features for free? Yes, except for the premium services. In MY ACCOUNT, you can buy credits for 10, 20, 50 or 100 euros (i.e. to send invitations to download an mp4 file or DVD). TIP: NEWS is a tool which allows you to share your personal information and current accomplishments (i.e. films released, awards received, shoots beginning, new division, etc.) Your news is visible to anyone logged onto Cinando via the "Latest News"' section on the homepage or in your company profile. - Click on NEWS in the toolbar > "Create News"'"
- Go to the home page in the Latest News section and click on ""Create News". When you create or modify news, you can choose to temporarily hide your post until you want it to be published and visible to all - just select either "Visible"' or "Hidden"'. You can upload files up to 1GB (text, pictures, documents...) + one video up to 1GB. In "Latest News,"' you can instantly respond to news by adding comments and sharing them on Facebook, Twitter or by email in 'Latest news'. How do I modify or delete my personal news? How do I manage my festivals agenda? In addition, on the right-hand side of the home page, you will find the Festival Attendance section where you can view the list of attendees. TIP: My Messages is your private mailbox on Cinando. Click the envelope icon in the toolbar to open the MESSAGES tab (an envelope icon). If you have unread messages, the number will appear in the red icon. Click on "See all messages"' to access your full mailbox. - Send a private message in Cinando if the envelope is red and not clickable (this means the person hid his email address and chose to communicate only via Cinando). How can I add contact information to my Outlook contacts? Visit a user's profile page. To the right of the person's name, you have a range of networking icons to choose from. TIP: Click on the Add to Outlook icon to transfer someone"'s contact information directly to your Outlook address book. TIP: Groups aims for a more private approach towards communication among professionals as well as sharing ideas, projects, and more. You can find Groups in the head toolbar. In each group, you have access to other members, group postings, news and shared films. How do I browse for groups? To browse for groups, click GROUPS in the toolbar, then "See All Groups"' on the right side of the page. - Public: people can join immediately. Once you"'ve joined a group, you can privately communicate with your fellow members by publishing "Postings"' (see below). To create your group: click on 'Create a new group' in the GROUPS tab. Fill in the requested fields and clearly describe the purpose of your group. Next, Specify the status of your group, then validate. How to join/leave a group? In the GROUPS tab, click on 'See all groups,' then either "Join a group"' or "Request to join."' To leave a group, go to the group and click the red button "Leave group"' on top right of the page. How do I post something within my group? How to invite someone to a specific group? Once you are on a profile, click on 'Invite to join a group' button: .Once you have sent an invitation, this button will become inactive. How to remove someone from one of my groups? Click on 'Remove from my group"' either in the user's profile or directly in the group's page. How do I know if I have received invitations? You are notified by email if you have received an invitation. TIP: With your company's Cinando profile, you can share information about your contacts, films, and more! To access your company profile, click on MY DATA. From there, you have access to your company summary, your staff member profiles and your films. Highlight your films in Cinando by creating dedicated pages, uploading stills, trailers and even the full movie! How do I change my profile/company information? Some of your company data is not able to be changed directly by you as it has been preset by previous entries and/or validations from the Cinando Team. In the COMPANY tab, the fields which can only be amended by the Cinando staff are your company name and the organizations of which you are a member Member of. If you wish to change these fields, send a request by email tocontactus@cinando.com indicating the old data, the new info and the reason for the change. What is the Buyer Status? How can I receive Buyer Status? When you work at a sales or distribution company, an automatic Buyer Status request is sent to our Certified Buyers Committee. Buyer status is determined depending on your market attendance, acquisitions and film library titles. You cannot appoint yourself as a Buyer on Cinando, as it is certified information and thus is subject to approval. How to delete my company account? How do I create a new account for a staff member? Go to your company page in MY DATA"' Click on the STAFF tab then "+Add a new staff member."' Fill in at least the required information in order to validate the new profile (first name, last name, email address, job title and fields of responsibility). Each staff member has his or her own login details (email username and password) that are sent via email once the new profile is created. How do I organize the visible ranking of my staff members? Go to your Company page via MY DATA and click on the STAFF tab. On the left-hand side, you will see a ranking next to each staff member. Change it and validate at the bottom of the page. The staff members will appear in the order you defined. How can I be listed as a buyer? Once you are granted "buyer" status for your company, you will be able to choose designate each staff member as a "buyer." How can I hide a person? Go to the user's profile via MY DATA. Click "Edit"' in the Settings box and select "Yes"' to Hide. Admin rights allow a person in your company to modify your company or film details, manage viewing rights of films and send invitations to watch them. How do I add/remove admin rights for a person? To add or remove admin rights, go to the user's profile via MY DATA. Click "Edit"' in the Settings box then either "yes"' or "no"' for admin rights. *Please note that if a person does not have admin rights, he or she will not be able to update any data. How do I delete a person from my company account? How do I forward my personal profile to a new company? Send an email to contactus@cinando.com. I have two or more staff profiles on Cinando. How do I switch between my company accounts? Once you are logged in, on the top right of the home page - where you enter your login details - you will see your name and company underneath, with a drop-down menu. To access your other company account(s), just click the bottom arrow and the drop-down list will appear with your various companies. Once you click on the company in the drop down list, you will then be logged in under the chosen company. TIP: Fill in all of the sections on your film page - the more information, the better the chance that the film will be recognized and discovered! Don"'t forget to include information about which countries your film is available for sale or distribution. How do I create a film page? Go to your company profile via MY DATA. Click on the FILMS tab then "+Add a New Film."' In order for the film page to save, be sure to fill in all of the required information (title, your company"'s role in the film, genre, countries of production and year of production). NOTE: If your film has a market screening, the information will automatically be added by the Cinando team. How do I upload stills and/or a trailer/promo-reel to the film page? Click on MY DATA then the FILMS tab. Scroll down and select the film page in which you want to upload media. In the Media section of your film page, you can add pictures by clicking "Edit" Thumbnails. In addition, you can add documents, trailer(s) and a screener by clicking "+Add"' next to the desired option. How can I mention that my films are selected in a film festival line up? Go to your appropriate film page then click "Edit"' in the Festivals & Awards section and fill in the festival information. For leading international festivals, the information is managed and verified by the Cinando team. How can I modify my film's visibility? Go to the film page via your MY DATA interface then clicking on the Films tab. Once you are on the film page which you want to hide, click "Edit"' in the Settings box then "Yes"' to Hide. How do I manage information about markets and screenings? Go to your MY DATA interface then click on the MARKETS tab to manage this information. How can I select countries where the rights of the film are available? Go to your film page and click "Edit"' in the Basic Information box. Your "Role"' in the film must include distributor in order to select countries in which the film is available. Once you have indicated your role as distributor, you will see a "Distributor"' section just under "Role"', where you can select available territories and your rights to the film. TIP: Highlight and showcase your films in the Screening Room while maintaining total control of your viewing rights! How secure is the Screening Room? The Cinando Screening Room is a dedicated and secure place to upload, screen and share your films. Access to Cinando is restricted to film industry professionals. The Cinando team regularly updates the Cinando database and pays particular attention to the eligibility of its members and potential subscribers. When you choose to upload a film onto Cinando, you maintain total control of the screener. From visibility to the viewing rights and more, you choose who is allowed to watch your films among the Cinando community: distributors, sales agents, festivals, all members, or by invitation only. In addition, you can hide your film at any time as well as send personal invitations, even to non-Cinando members. ...and that's not all! To make sure the Cinando Screening Room is absolutely secure, we employ pure streaming technology (unlike Vimeo). Thus, the screener file is never downloaded into the cache of viewers"' computers which means that one cannot obtain the file. Moreover, each film is watermarked and personalized with the invitees' name as well as a generated ID specific to them. The screeners are watermarked in real time and not encrypted into the image, but rather as a layer. How much does it cost to upload a screener to the Cinando Screening Room? We host your film free of charge for the first six months. Thereafter, each film costs 5 € per year. How do I upload a film to the online Screening Room? - Once your file and your film page are set, you are ready to upload the screener. 1. In your film page, click on "+Add"' next to the Screener section in the Media box. a. MY DATA > SCREENERS > Type the title in the search field and once it appears, click "+Upload screener"'. - When you get to the upload page, click on Browse and select your file. - no anamorphic material (file has to be 4:3 or 16:9 originally). - The upload should not take more than a few hours. You will see the progress bar, and at the end of the upload, it will disappear and a message will appear and inform you that the file is now encoding. From this moment on you can leave the page. Several hours later you should receive an email informing you about the film being available online. - Your film will not appear in the Screening Room until you validate it! If everything looks fine, click "Validate." Your screener is now in the Screening Room! Once your screener is validated, you should proceed to set up its Viewing Rights (on the left-hand side of the same page). - Invitation requests allowed: Select this box to allow users request to watch your film. If you do not select this option, only users with viewing rights can see that you have uploaded a film. You can choose to select only this option, so that everybody has to send you a request before being able to watch your film. All requests are sent to the person of your company indicated in the box labeled "Contact Manager"' who can choose to accept or simply ignore individually the requests. - Geo-blocking option: you can restrict access only to countries where the film is available (based on the countries you select as available when updating the film page). - Hide: Select this option to temporarily deactivate your film on Cinando. Even people you have granted the access will not be able to watch the film anymore. You will still be able to send out individual invitations to people of your choice, and they will be the only ones who can access your screener. There are several types of invitations. - Pure streaming (free): highly secured streaming where the file cannot be retrieved from the computer cache and has a watermark encrypted in it with the individual ID of the person watching. - Progressive download (free): Used by most of the VOD platforms, provides a smoother viewing experience. For security reasons, we advise you to send these invitations only to trusted individuals as progressive download makes the file easy to retrieve. - iPad invitation (2€): requires the viewer to download the Cinando Viewer App and log in to it at least once. The file is then downloaded to the iPad and can be viewed and deleted but not retrieved from the app. It also included the individual watermark. - MP4 download (1,20€): the invitee will receive a link on they email, the file can be downloaded only once. It also included the individual watermark. The SCREENER ACTIVITY tab is also where you manage your screener invitations. You can revoke, renew and resend invites in this section as well as view which type of invitation each invitee received and receive viewing reports. The mp4 file will be re-encoded and individually watermarked with the name of the person you are inviting. If you are sending an MP4-to-download, you can add a secret code in order to ensure your invitee"'s identification. For Cinando members, you can revoke access by deleting a film invitation after any amount of time you prefer. The viewing reports are spreadsheets which gather analytics such as who"'s watched your film, when and for how long. You can access these reports in the SCREENER ACTIVITY section by clicking "Viewing Reports"' at the top of the page. 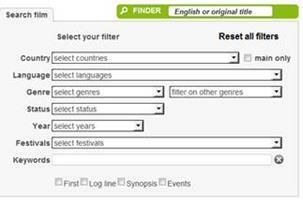 If you are browsing for specific types of films, narrow down your search with our many filters such as genre, main country of production, available territories and more! - Advanced Search - for a filtered search of a specific category. At the top left of the home page, you will find the Quick Search tab. Type in a film, company or person and the results will be sorted by categories. Database Finder is just below the Quick Search tool on the home page. The autocomplete system will target the result as soon as you are writing what you are looking for! Within the respective Companies, People and Films tabs on the home page, you will find a comprehensive advanced search tool where you can choose from many filters to optimize your search. 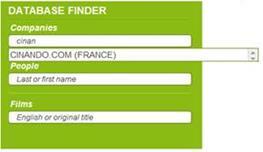 The "Finder"' works as a database finder tool within the chosen category. Add various criteria to narrow down your search within the database. Check the boxes next to the corresponding keyword to filter your search accordingly. If you click on 'Reset all filters', it will erase your current selection (besides the Market filter). To learn more about a market filtered search, please visit the Markets section below. You can sort your search results by clicking on the little arrow next to the headings of each column (i.e. Company Name, Activities or Country...). Additionally, you can choose to display 12, 48 or 96 results per page. TIP: Combine the Keywords search with the chosen criteria above (i.e. country, language, etc.). Hint: You can create lists from your advanced searches results by clicking "+Add to Favorites." Or, you can "Export to Excel." Stay informed of a market's exhibitors lineups, films in screening, festival sections and detailed screening schedules. How do I find information about markets? To find specific information on markets, you can utilize our Markets section which appears in each of the tabs - Companies, People and Films. Choose the market in which you want to browse, then you can select various market filters. TIP: When browsing in the Markets section, you can simultaneously utilize both the market filters as well as the traditional filters (to the left). When you select a market in this tab, all of the companies attending the market will be listed below. Additionally, you can narrow your search to solely exhibitors. NOTE: Keep in mind that, if you are looking for screenings in past festivals, you must unselect the current festival and select "None" in the Market Filter. If you select a market, all of the market attendees will appear in your results. - Click on "Screening Schedule" to access the detailed market screening schedule. You can sort your screening schedule results by a selection of filters such as date and screening time. Once a screening is selected, you have the option to "schedule"' the screening on your Outlook calendar by clicking the Outlook icon. - Films in screening: in the Screening Schedule, you can select and then search for different types of market screenings, restrict your search to Market Premiere or Market Debut or filter your search within a particular festival"s selection related to the chosen market (i.e. Festival de Cannes "Directors"' Fortnight"' films screening at the Marché du Film). How can I mention my temporary market address? Go to your MY DATA interface and then click on the MARKETS tab. Input your market address and contact details in the COMPANY section. Under the section for the upcoming market, edit the contact details for your company in update mode. You must choose whether the address is an office (accessible for postal deliveries and meetings) or solely a contact address (for postal and calls). How can I indicate my market attendance on my profile page? You are not able to tag your market attendance on our own. As Cinando is in partnership with the main international markets, we update your attendance accordingly upon receiving the official attendees"' list from the respective market. What is the Market Status of a title? - Video Library: the title can be watched on specific computers within the market. You can set up and change the market status of a title by going to the film page. Click on "Update my data". How can I add my Market Line-up screening schedule? Screening schedules are directly input by the Cinando team. Once we receive the official screening schedules, we will update your film page accordingly. What is the Market History section? The market history sums up all the markets where the film was introduced. Even if you choose to include a title as part of your market line-up, it will appear in your market history section. You can view the market history in the film page in the section 'Previous markets'. Click on "Full history"' to view all previous markets. You cannot manage this section which is automatically filled in based upon information you specified. TIP: Lists can be used to keep track of people, companies and films. - In a Multi-criteria search (see section above), you just need to click "Add to Favorites"
Then you can select in which list you want to enter this contact or film. In the LISTS tab on the toolbar, click on each list to modify. You will be able to rename, duplicate or merge them. You can add a memo to each item, export your lists to Excel, or print them directly. NOTE: Email addresses are not shown in lists due to our anti-spamming policy. Only verified Sales Agents will be able to access the e-mail addresses (upon approval by Cinando). If we receive complaints from other members, Cinando reserves the right to remove access to e-mail lists. TIP: Notifications allow you to be kept regularly informed. How do I create and manage notifications? To manage your notifications, click the SETTINGS tab (the wheel icon in the top left-hand corner of any page) and select the desired frequency (daily, weekly or monthly). Click on the Screening Room or access it by clicking on "See all"' in the home page "Now available in Screening Room" carousel. As in the Advanced Search section, you can browse the Screening Room by filters. Some titles are viewable directly. For some titles, you can be asked to send a request before being authorized to watch the film. The request will be automatically sent in the Cinando mailbox and email address of the rights owner. TIP: Our Focuses gather films screened in markets or in main film festivals selections such as Festival de Cannes, La Quinzaine des Réalisateurs, Karlovy Vary, San Sebastian, TIFF, Busan, AFM and more. Watch them online! Click on the Festival in Focus tab or visit the home page section Catch-up on Festivals which showcases the current and upcoming events. When clicking on the "Catch-up" section, you can also access a user's market/festival dedicated page. If there is recent info on a market, it includes films screened in the market whose companies accepted the promotion on Cinando. What do I do if I want my film to be part of a Film/Market focus? If there is a partnership with the market/festival and your film is part of the festival selection or presented in the market, we will directly contact the company to offer the film to appear in the Film/Market focus. TIP: Give a preview of your films: showcase the trailers! How can I watch trailers? Discover new trailers on the home page and find them again in film pages: the trailers are automatically played. - Current market database available in offline mode all year round and during main markets. Cinando.com is designed to work with most modern Web browsers. For enhanced results, we advise you to always use the most up-to-date version of your web browser. Optimize your browsing experience on Cinando! - Cinando.com supports Microsoft Internet Explorer 8 or higher, Mozilla Firefox 3.5 or higher, or Apple Safari 5 or higher, and Google Chrome. These browsers are widely used, and their manufacturers provide continual security updates. Cinando.com is currently not supporting advanced functionality on the Opera browser. - Be sure cookies are enabled. "Cookies" are small files that cinando.com and other Web sites store on your computer, allowing those sites to "remember" your preferences and require you to enter your password less frequently. They also allow you to use certain features in the black toolbar on the Cinando website. - If you use a pop-up blocker, you may want to temporarily allow pop-ups while on cinando.com. This ensures all information is displayed and all cinando.com interactive features will work properly.